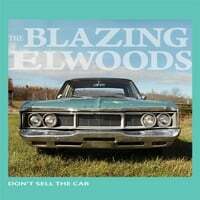 The Blazing Elwoods CD Is a foot Stompin', Toe Tappin, 12 song old school country album, inspired by the likes of Cash, Williams and Conners. My friend Rick Moggy and I wrote this tune about a nickel town in Ontario. None of it’s true, but all of it somehow falls into not so recent mid-90’s memories. I had some awesome help with musician friends in this song. Marc Donato on Mandolin, Donny Reed on Violin, Peter Learn on Piano, and vocal help with Sean Barrette and Chris Leblanc. Another one of my favourites. Co-written by my friend Rick Moggy, it’s about a motorcycle trip that never happened, but someday it just might. Rick and I shared the vocal duties on this one as well, but the Piece de La resistance is the chorus. I can’t help but smile when I hear Myself, Rick, Sara Matt, Sean Barrette and Chris Leblanc singin’ the Shalalalas!.. Also can’t forget to mention Peter Learn and Mark Donato’s Piano and Mandolin playing..
Well, I’m happy to say that when I write a tune, you never have to really think “Hmm, He’s so deep! What is he possibly writing about”?.. So, This song was going to be written for my brother Eric., Then it took on another slant in which it went to “help a brother out”, and then it took on a deeper meaning. It is my first christian-esque country song, and everytime I sing it, I feel very good. Had Sean Barrette, Kevin Closs and Chris Leblanc help me out on the vocals with this one. Along with Eric, these guys are my brothers as well.. Again. Peter Learn Twinklin’ the ivory and Marc Donato playin’ the mando. So my dad got this old 1968 Polara from my Grandma Grace Cunningham. I love this car. Sarah Matt came in and helped out with her amazing piano playing and her beautiful back-up vocals. Hearing her voice always sends a shiver down my spine. I also coerced Brian Quebec to come in and lay down some Stand-up Bass. Tryin’ to keep it real! Worked out well . So I married a french girl. She’s the only one for me. We’ve been together since high school and to give you an idea, that’s been over 25 years.. Her family is really and truly my family. Her relatives are from Noelville Ontario, and they know how to have a good time. Uncle Gil knows a lot of chanson repondre tunes so I thought I’d take a stab at writing one. This was started many years ago, and I’m glad it’s completed. The highlights for me on this song were of course Nick Krawchuk on spoons, Marc Donato on mandolin, Andrea McColeman on accordion, Donny Reed on fiddle, and Brian Quebec on stand-up bass. These elements for me completely made the French Canadian Connection happen. For the crowning touch, Les Troubadore members, Isabelle Ratté, Yves Larrivière, Jean-Guy Rivard and Johanne Rioux dropped in to sing as well. One clear cold January morning I headed out to my fishing hut on Ramsey Lake, here in Sudbury Ontario, and I brought my guitar and a little recorder. I wrote 3 songs in 4 hours.. Didn’t catch a damn thing, but was a very productive day just the same. Don’t Bother Me was kinda inspired by my Uncle Doug. He lives a very barren existence, but he never complains about the state of his self induced living conditions. It is what is.. And he is who he is. He’s a very special man my Uncle Doug. Love him with all my heart. Had the pleasure of my step-brother Kevin Closs joining in for some harmonies..and again so grateful to have my friends Peter Learn and Marc Donato playing Piano and Mandolin respectively..
Dad told me that there was a farm family in Aberdeen Saskatchewan that would hold barn dances on weekends for folks to get together and socialize. He explained that there would be musicians hired, or would just show up and play at these community gatherings, and all the families in the farming district close enough to attend, would attend… They would eat, drink, dance and be merry. ( I asked Dad about the use of Alcohol/Drugs etc at these events, and he said it was extremely rare that he would see someone partaking..it was 1945-ish) It sounded really nice. Made me think it would be nice to go back to that time and be a part of it. This song was another treat to write and record. I called on my friend Andrea McColeman from the Yukon to do some long distance accordion tracks, I brought in Brian Quebec for his stand-up bass playing skills, my mandolin player Marc Donato, the great Donny Reed on fiddle and I learned to play the harmonica. Good times, and I love how it worked out.. I kinda pictured a down-on-his-luck Saskatchewan farmer who’s truck had broken down. Parked right next to his broken down pick-up is his shiny new Tractor. Then I laughed to myself because I pictured a certain dairy farmer driving to Noelville, Ontario to get a case of brown pop. So, this is basically the first country song I had ever written. I wrote it for my Dad Elwood Wohlberg. It’s about this nasty rooster that lived on a farm in speers Saskatchewan. I’m especially proud of my guitar solo in this one.. and particularly pleased with Chris Leblanc’s exuberant crowing.. Good Times!